Need a plumber in Arizona that you can trust? Many Arizona home and business owners feel that plumbers charge too much! 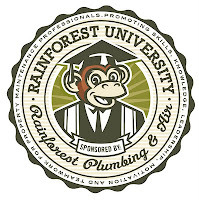 Rainforest Plumbing & Air solves the customer satisfaction problem with the ONLY "Up Front Guarantee" in the business. That's right... you can know exactly what plumbing repairs, upgrades or installations will be done on you Arizona property and exactly how much it will cost BEFORE our technician starts any work. There is no other plumbing company in Arizona that offers the Up-Front-Guarantee, it is a RainForest exclusive. Guaranteed plumbing repairs means a win-win situation for both of us. You get exactly what you need at a fair price and we get to have satisfied customers who refer us whenever they can. Because of our Up Front Guarantee, it is rare that we ever have a customer service issue so we can spend our time making more calls and becoming the most prompt plumbing service company in the valley! If you need a plumber NOW... Rainforest offers 24-7 emergency plumbing service valleywide at 602-253-9376. Click on any of the topics on the left-hand side of your screen to find out more about common (and not so common) plumbing components and problems and how Rainforest Plumbing & Air can alleviate them! CALL: 602-253-9376 FOR IMMEDIATE SERVICE! But a clogged drain gets all the attention in the world. All drains eventually lead to the same place, so one drain problem can soon cause another if left unattended. That's right... whether it is a sewer drain, sink drain, bathtub or shower drain in Arizona that is slow or clogged... make sure to get it fixed right away! A clogged drain can cause flooding from a sink, washing machine or bathtub and then you have the water removal and clean-up to worry about. Many Arizona homes have flooded and ruined their carpeting by neglecting a simple drain clog that could have been easily cleaned out by calling a local valley plumber. Some Arizona drain problems are as simple as a hair ball in the sink... while others could be as serious as tree roots growing into your main drain and creating root damage to the underground pipes. The biggest mistake people make is waiting until it is too late. When your drains are acting up and draining slowly... make sure to have it cleaned out right away. A backed up drain or sink can cause lots of damage to your home if the sink or tub overflows.